Successfully Added Wotofo Conqueror Mini RTA - Dual Coil, Postless Deck, 2.5ml Capcity, 510 Thread, Top Filling, Bottom Airflow to your Shopping Cart. The Wotofo Conqueror Mini is a rebuildable tank atomizer (RTA) with an original post-less dual coil design. 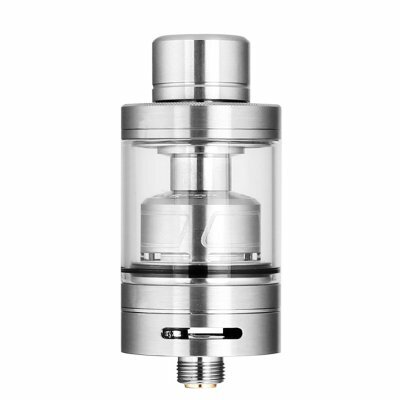 This well machined RTA has a smooth airflow control (AFC) ring with two slots. With its good range, the airflow of this atomizer its short height and 2 cols will together bring you a satisfying taste and large vapor clouds. The Conqueror's intriguing 2 coil feature becomes apparent when viewing the deck which allows 2 coils to be inserted into the 2mm holes. These coils are secured by grub screws located on the sides of the base. Thanks to its postless deck design the Conqueror Mini is easy to build on and offers plenty of space for your coils and wicks. This RTA also features a top control ring that allows for perfect wick saturation as well as easy access for top filling and a 2.5ml capacity. A beautiful combination of stainless steel and Pyrex glass gives the Wotofo Conqueror Mini a stunning appearance. With a 22mm diameter and Gold plated 510 pin thread the Wotofo Conqueror Mini brings you great control over your vaping. The Conqueror Mini RTA has coils, cotton, spare o-rings, Pyrex tube and mini screwdriver included. It comes with 12 months warranty, brought to you by the leader in electronic devices as well as wholesale e-cigarettes, atomizers, and accessories..